It’s easy for a reviewer such as myself to pass judgment on any show that comes our way without much care or thought put into what we watch. We can sit down, watch the entire show’s length from start to finish, either weekly, in sessions, or all at once, then maybe spend an hour or two writing down our analysis or make a video detailing the anime’s story, characters, and aesthetics before slapping on a number score or a few choice words saying it’s ‘good’ or not, then move on with our lives. Sure we, like others, may have our favorite shows, but the majority of what we watch are seasonal shows that for the most part, fail to impress our standards of what we consider to be ‘good’, whatever that may be. 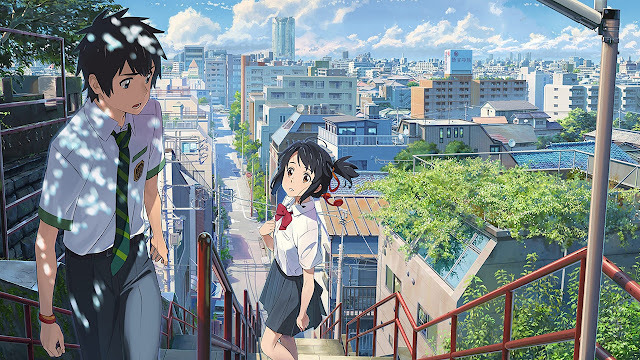 So when I heard of the worldwide success that Kimi no Na Wa had achieved that, at the time of writing this, still garners audiences in theaters nine months after its original release, I found it a tough pill to swallow. I mean, its sheer existence appeared to boast the coveted title of the ‘perfect anime’, a title that I had long since saw as impossible after having watched several hundred anime and counting. Despite all its hype, all of the praise, and everyone around me basically screaming at me saying that it was a good movie, I…honestly don’t think the same way. If you ask me, the middle section was muddy, several things don’t add up, and there’re some stylizing choices with its ‘anime opening’ at the beginning of the movie that I think shouldn’t have been there. Indeed I think the hype bumped up my expectations more than they should be…but why should I listen to my mind when my heart thinks otherwise? There were noticeable problems, but for once in a great long while, I was enraptured by the story. I was able to witness the raw, human emotion of desire and curiosity. I was able to hear a beautiful score accompany the two main characters. I was able to walk alongside them on their journey, enjoy the breathtaking sights they saw, and feel the emotions that they felt. I didn’t care about what they could’ve improved on. And this is a feeling I’ve greatly missed. As anime reviewers, we can get so caught up with watching shows and looking at what they do well and what they do bad that it becomes a tedious nitpick of what warrants a genuinely good series. At the end of that process, there are no good series. Everything is either average or below averages with the occasional show that rate maybe slightly higher than the rest. But when that kind of thinking is peeled back, you start to see things that you’ve never been able to see before. Kimi no Na Wa isn’t perfect, but perfection. It doesn’t need to tell its story perfectly to the last detail; it just needs to tell a story worth experiencing. It doesn’t need the best characters; it just needs characters worth watching. So in my eyes, Kimi no Na Wa is perfection. It could use some changes, but I don’t think any of those changes would help in what it was trying to do. And that’s probably why I’m stuck in a stupor drunk off of not what Kimi no Na Wa has, but what Kimi no Na Wa is. As I’ve grown older, the days where I would watch anime end on end with such caring devotion have faded into memory and have turned into moments that I wish I could experience all over again. The weekend where I watched all of Sword Art Online without breaks, the tears I shed watching the sunflower scene in Clannad: Afterstory, and the soul-crushing feeling I felt watching Kousei’s personal struggle in Shigatsu wa Kimi no Uso were all moments in my life that showed me why I love this medium. I miss the days where I could laugh and watch something for what it is, not what it could or should be. And if you ask me, that’s how anime should be watched. We reviewers should look for what makes the anime something to experience. Indeed being critical is still needed to give a reader or viewer a heads up on what to expect, but it should not be our position to place absolute authority on whether or not something is definitively ‘good’ or definitively ‘bad’. Because in the end, we all love this medium, and don’t we all want more people to love the things we love? Author Bio - PyraXadon is one of the top 50 anime reviewers on the popular website MyAnimeList. You can learn more about him at his MyAnimeList profile page, or his Wordpress blog.